Telescope Goldfish (syn: Carassius auratus gibelio) The Telescope Eye Goldfish derives its name form its large and protruding eyes which was described by Bloch 1782. Telescope Eye Goldfish are fairly easy to raise. Their temperament is calm, Peaceful. Their Maximum Length is about 8 to 10 inches, depending on the size of the tank for them to grow the bigger the tank the more they grow. the minimum Aquarium is 20 Gallons, Water Conditions sould be 65-75 F, KH 4-20, pH 6.5-7.5. Their diet is that of Omnivore. Their origin is from Asia, Japan, China. The family of Cyprinidae. Their life Spanis about 7 to 12 years but can live longer. Telescope Eye goldfish are a Community fish. The Telescope Goldfish derives its name form its large and protruding buggy eyes. The Telescope Goldfish is known by several other names as well, such as Globe Eye Goldfish, Dragon Eye Goldfish and the Japanese word Demekin. There are three eye shapes that are agreeable, that make up Telescope Goldfish. The flat eye, the dome shaped eye, and the simple, round eye. The dome shaped eyes are wider at the base of the eye and becomes narrower at the top of the eye. Just like the name says. The round eyes can be found in many degrees of attachment to the head of the fish. 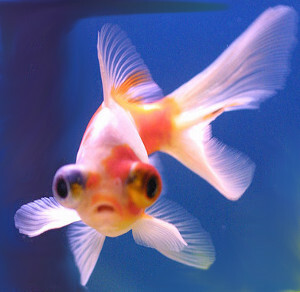 Some Telescope Goldfish have round eyes that look like they will detach from the fish at anytime, while others have more than half of the eye attached to the head. flat eyes are a little flattened at the top. Regardless of the shape of the eyes, they should be always equal in size and protrude outwards. The Telescope Eye goldfish comes in many different color, such as white, red, orange, calico, red-and-white, tri-colored, blue and chocolate. Another very beautiful, but rare color variation is that black-and-white, also known as the Panda-Telescope-Eye. A Telescope Goldfish has an egg-like-shaped body with a double caudal fin. The body depth of a Telescope Goldfish should always be larger than 2/3 of the body length. The fish should have long and flowing fins, and the caudal fin comes in several different types of goldfish such as veiltial, butterfly, normal Oranda tail, and broadtail. The Telescope Goldfish comes in a variety of colors and sizes, but all Telescope Goldfish have the protruding buggy eyes and the long and smooth flowing fins in common. The Telescope Goldfish makes a lot of waste, and should be feed several times a day in small portion, the gold fish doesn&apos;t have a stomach that is why you should not over feed, they should not be kept in less than 20 gallons of water. 20 gallons must be the least amount, and the more room you can provide your Telescope Goldfish with, the better the fish will live. Their telescope eyes limit their eye sight they do not see very well. Fast fish, such a Oranda Goldfish, Comet Goldfish and Koi, will eat all the food before the Telescope Goldfish get a chance to eat some. So you should keep your Telescope Goldfish with other Telescope goldfish, or with other fish with equally poor eyesight such as Celestial Goldfish and Bubble Eye Goldfish. Don&apos;t put plants or ornaments with sharp edges in the aquarium or pond, since the Telescope Goldfish can easily damage its eyes on sharp objects.You should make Filter intake tubes covered in aquarium sponge or something comparable to the sponge. Prepare the tank. Read up on the nitrogen cycle in aquariums. You will need to purchase a liquid test so that you can test for Nitrates and Ammonia. Strip-style test kits are unreliable and a waste of money. Use a dechlorinating product to remove the harmful chlorine from the water. Get coffee bean sized gravel for the bottom of the tank (if it is any smaller the goldfish could accidentally swallow some while feeding). Make sure any rocks or gravel are metal-free, since rocks with metals can harm fish by leaching toxic residues into the surrounding water. To decorate your tank, Buy a few ornaments and decorations and fake plants. Do not buy ornaments with openings small enough that the fish can get stuck in them. Remember to consider how large your goldfish can get. When choosing decorations you should add plants; goldfish will nibble on some live plants, usually tough plants such as hornwort, vals, anubias, and there are others that are fine. When buying your Veiltail goldfish see which ones look like the healthier ones. Be wary of tanks with dead fish in them, as this can be a sign of illness or improper care. In addition, healthy fish will have no white spots, swim with their fins held upright, Have a nice rich color or colors. Not be afraid of people, Swim around all over the tank and look healthy. Add the Telescope Eye goldfish to the tank. It is important to introduce the fish to the tank environment slowly. As soon as you get home, float the entire, closed pet store bag (with the Telescope Eye goldfish inside!) in the tank for about half hour. This will allow the water in the plastic bag and the fish is in to equal out to the same temperature as your tank. Next, add a small amount of water from your tank to the bag, and wait about 15 minutes. Do this at least one more time. Dispose of the water down a drain or outside. Then, use a net to transfer the Telescope Eye goldfish fish carefully into the your tank. Dispose of all of the water in the bag. This process not only reduces stress for you fish, it also prevents the dirty pet store water from contaminating your tank. Clamped fins are a sign of illness Getting your Telescope Goldfish to accept different kinds of food, such as pellet, frozen food, flakes and vegetables and one of the best ways to feed them,is to get the fish used to your hand, this allows you to control exactly how much food your Telescope Goldfish will get. Your goldfish needs to get some food and prevent other fish from stealing it from them. One other method is to use sinking pellets, and always place them at the same spot in the aquarium or pond. Your Telescope Goldfish will eventually get trained that the food can be found on the bottom of the tank and will spend his time carefully looking for that area in his own goldfishes pace. When you feed your Telescope Goldfish vegetables like lettuce and cucumber you can use a feeding clip. Always place the feeding clip at the same spot. Floating food like bloodworms should be put in a feeding cone, and the feeding cone should always be placed at the same feeding spot.